Uttarakhand, the Land of Gods, is counted among the popular travel destinations by pilgrims because of its religious significance. With snow covered mountains, high mountain ranges, thick forests, lush greenery and holy shrines, the place is like a heaven on earth that attracts travelers and pilgrims from around the world. Every year thousands of pilgrims travel to this beautiful and holy place to offer prayers to their Lord and get some fresh healthy air and peace of mind. There are numerous sacred yatras that you can undertake in Uttarakhand. Panch Prayag yatra is one such journey that provides the peace and support you may be seeking for your soul, mind and body. A yatra to Panch Prayag will take you to five divine places that stand for holy rituals and worship. The place is regarded as the essence of everlasting piety. 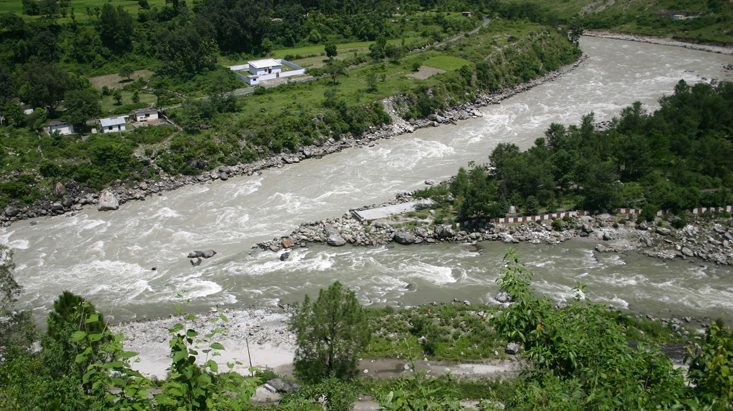 The Alaknanda river flowing along the four confluences of Panch Prayag – Vishnuprayag, Nandprayag, Karnaprayag, Rudraprayag- finally meet the Bhagirathi river at Devprayag, the fifth Prayag, to form the Ganga, the holy river of India that has brought salvation to this land. According to Hindu legends, earth was unable to bear the force of the Ganga when it started descending to earth. To control its force, Ganga was divided into 12 channels. At Devprayag, Alaknanda meet Bhagirathi to form the Ganga, higher up from Devprayag, four other meeting form the sacred Panch prayag that pilgrims visit for prayers, bath, purification and worship. Panch Prayag of Garhwal is the second most important prayag out of 14 prayags in India. Panch Prayagis famous for its religious significance. So, let’s take a look on all the pious destinations of the Panch Prayag in detail. Out of the five confluences, Devprayag is believed to be the most pious. It is the point where the Bhagirathi that rises at Gaumukh and the Alaknanda, which originate from from the Satopanth glaciers located on the eastern side of Chaukh­amba Peak, merge to form the Ganga. Devprayag forms the birth place of river Ganga. The place is located on NH 58, Delhi-Badrinath high­way. It is approximately 69 km from the north-east of Rishikesh via Shivpuri and Kandi. You can either take a bus from the Chandrabhaga Depot which will charge Rs 80 for 3 hrs journey or a taxi from Rishikesh which will cost Rs 1,100 but take less time. Buses from the depot are available between 5 am and 4 pm only. You can take a bath in the sangam and get rid of sins commited in your previous, perform shraadh ceremony or holy rituals. Worship in the Ganga Temple that stands at the sangam. Witness the beautiful Raghunath Temple. It is said that here Lord Ram and Laksman in the Treta-yuga performed a yagna seeking forgiveness for killing Ravana, who was a Brahmin by caste. The main temple of Raghunath ji is surrounded by four small temples on each side – Annapurna Devi, Narsingh, Hanuman and Shri Garur Mahadev. Near the Ram Temple lies the Chandeshwar Mahadev Temple. It is believed to be one of the ancient and holiest temples in the vicinity. You can visit the two libraries situated at this place where you can find out many old, rare handwritten manuscripts in Hindi and Garhwali. The bright green Mandakini, which flows from Kedar­nath, blend with the white Alaknanda, which flows from Badri­nath, and make the sangam at Rudraprayag. It offers attention-grabbing views of flowing waters in the lap of nature. Located 140 kms from Rishikesh, you can take a taxi or bus to reach Rudraprayag via Devprayag and Srinagar. You can take a dip in the sangam at Rudraprayag and attend Sangam aarti which take place at 6 in the evening daily. Witness a black rock well known as Narad Shila, where Narad Muni meditated for years to learn how to play the veena. Visit the Gangeshwar Mahadev or Rudranath Temple that stands magnificently under the shade of a peepal tree. See the Chamunda Devi Temple, one of the holiest temples of the goddess Chamunda. Visit the beautiful Koteshwar Mahadev Temple that lies to the north of Rudrayprayag and 7 km ahead on the road going to Pokhri. On the way, you can also witness some small temples dedicated to Mahadev, Durga and Hanuman. Karnaprayag is situated at the meeting point of river Pindar that flows from the Pindari Glacier and the river Alaknanda forming a broad sangam. It is believed that here the son of Lord Surya and Kunti, Karana meditated to be granted with the unassailable kundal (earrings), tuneer (arrow case) and kavach (armour) that made him unbeatable. Located 170 kms from Rishikesh via Rudraprayag and Srinagar, Karnaprayag lies on NH 58 that connects Delhi with Badrinath and Mana Pass. From Rishikesh, you can take a private taxi or bus to reach there. You can visit the ancient Uma Temple. According to a Hindu legend, Uma, the daughter of King Himalaya practiced strict austerities to get Lord Shiva. You will pass through many small temples lining the ghats from the Uma temple. You can also visit the Karna Temple as well as shrines dedicated to Lord Ram, Sita, Lakshman and Shiva which are located next to the shrines of Karna. Nandprayag holds the bank of green Nandakini River which flows from a glacier close to Nanda Devi and Alaknanda. The two rivers meet and flow together from here. According to legends, this prayag was known as Kanvasu earlier, after Maharishi Kanva. It was named Nandprayag after King Nand performed a Maha Yagna. Nandprayag is located 191kms from Rishikesh. You can use a Volvo bus or taxi to reach here from Rishikesh. There is no surviving temple on the ghats of Nandprayag as the solitary temple devoted to Nanda Devi got washed away in a flood. However, there are shrines of Chandika Devi, Gangeshwar Mahadev and Gopalji which are worth visiting. At Vishnuprayag, the impulsive Vishnu Ganga known as Alaknanda blend with the river Dhauliganga that flows from the Niti Valley. It is the fifth and final prayag out of five prayags of Garhwal. Vishnuprayag is 272 km away from Rishikesh. Both buses and taxies are available from Rishikesh to reach Vishnuprayag. Reaching the ghats through a narrow twisted path is fine, but taking a dip in ghats is a little difficult because of the strong currents. You can visit the small ancient temple devoted to Lord Vishnu. The Legend state that the godly mendicant Narad had meditated and got the blessings of Lord Vishnu here. All these five places together constitue the Panch Prayag pilgrimage tour to India. You can purify your soul, mind and body by undertaking a Panch Prayag yatra in Uttrakhand. Moreover, you can also get rid of all the sins of your previous birth by planning a trip to the holy Panch Prayag.